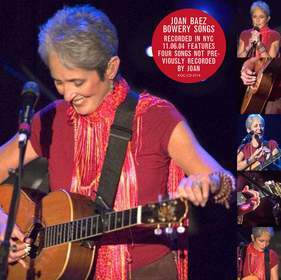 NEW YORK, NY -- (MARKET WIRE) -- August 5, 2005 --Over four decades after her landmark live album, "In Concert," Joan Baez returns with "Bowery Songs" -- a new live album that captures her November 6, 2004 performance at the Bowery Ballroom in New York City. USA Today has called Baez "the matriarch of modern folk music" and "Bowery Songs" celebrates her career and legacy with both classic and previously unreleased material. KOCH Records will release "Bowery Songs" on September 6. "Bowery Songs" features four previously unrecorded songs: Bob Dylan's "Seven Curses," Steve Earle's "Jerusalem," the hymn-like "Finlandia," and the traditional "Dink's Song." Baez is supported on the album by her recent touring band, George Javori, Duke McVinnie, Erik Della Penna and Graham Maby. The Washington Post recently said of Baez's live performances, "... still familiar after decades... she commanded newer compositions with grace and agility." In 2004, Baez released her first new album in 6 years, "Dark Chords on a Big Guitar" (KOCH Records) to critical acclaim. The Wall Street Journal said of the album, "... brings an almost conversational intimacy to songs by Ryan Adams, Greg Brown, Joe Henry, Gillian Welch and David Rawlings, Steve Earle and others." Baez will play a series of select dates this fall. Please see below for details.